So I've been wanting to share these for awhile. 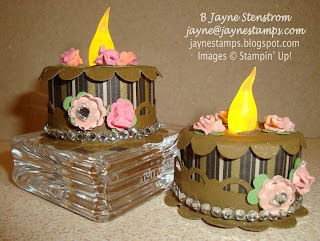 Have you seen any of the little "cakes" made with the mini tea light candles? I bought some of them a few weeks ago and when the ladies got together for our last Chalk-a-holics meeting, we made these. Aren't they cute? Paper: Mocha Morning Specialty DSP, Soft Suede, Blush Blossom, Regal Rose, and Certainly Celery card stocks. Other Accessories: Basic Rhinestones, Bitty Buttons, Shimmer Paint mixed with rubbing alcohol and sprayed on Soft Suede cardstock. If you have any questions on how I made these, feel free to shoot me an e-mail at jayne@jaynestamps.com.